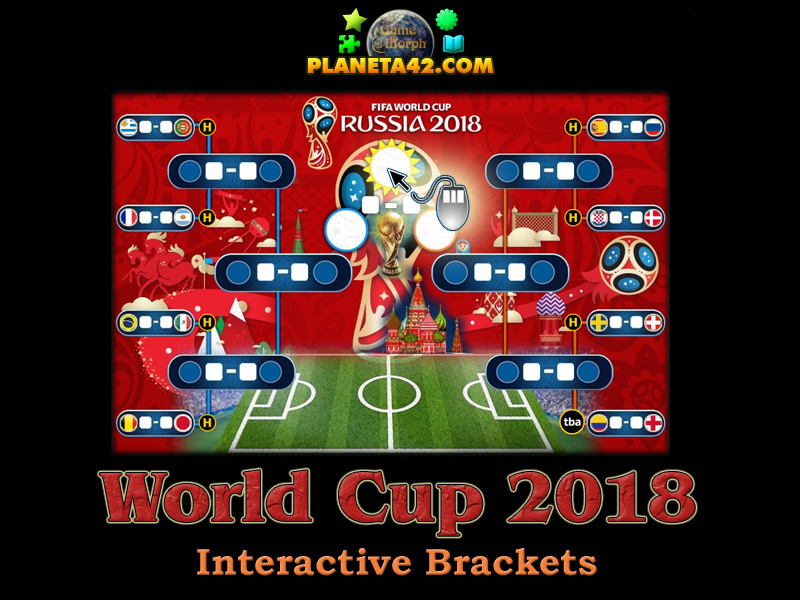 Interactive Brackets for the World Championship 2018 football tournament. "World Championship 2018" is a free online almanac game for fun review of the FIFA World Cup in Russia schematic. It will show a real historical result, as well as fun fictional results for every match played from the Round 16 to the grand final. A small flash app for desktop computers, laptops and tablets, which may be played in the web browser. The Sports Knowledge Board include the best 16 teams, to play with. 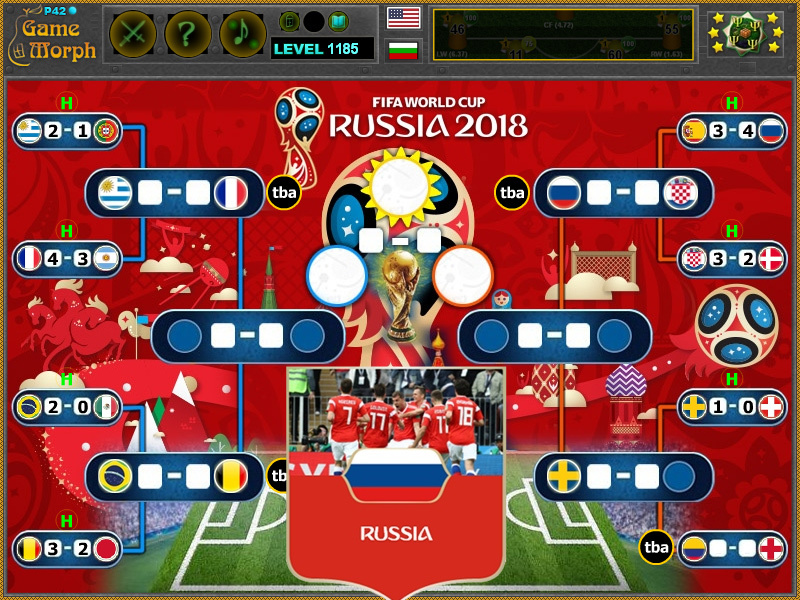 This app also apply for world cup 2018 tournament bracket, world cup bracket simulator, world cup simulator 2018, world cup bracket predictor, world cup 2018 predictor game, world cup 2018 predictions simulator. Program Code by Ogo Bob. How to play World Championship 2018.
will show the name and team of the country. The results in the white squares are empty and there are two options: to play the match with a random fictional result, or to show the real historical result. To play it random click the white blank result boxes, and to play historical, click the "H" button near the match. The next match will become available when all previous matches have been played. But the next historical result will become available only if all all previous matches are played historical too. This way, a certain match may be played for fun predictions, as the board is released during the Quarter-finals. Know the World Cup 2018 champion. Revealing a champion rewards +1 Knowledge Level. What is the result of last 15 matches of World Championship 2018? How many teams are in Round 16? Which are the best 16 national teams in World Championship 2018 championship? Which teams are in the Quarter-finals? What are the results of the Quarter-finals in World Championship 2018? Which teams are in the Semi-final? What are the results of the Semi-final in World Championship 2018? Which teams play in the final? What are the results of final in World Championship 2018? Who is the World Champion in 2018? Labels: Football Games , Board Games , Flash Games , Sport Games , Education Games , Interactive Bracketss.